Lets you carry more weight per strength point instead of the default 5. 5 different flavors available. Feel free to use the files as you see fit without my permission, so long it is not used for making money. An Oblivion version can be found here. Lets you carry more units of weight per strength point instead of the default 5. There are now 5 versions of the mod you can instal. Choose the version fit best for your style of play. If you find that the default is already enough or you don't want the added ease, then no need to download ^_^. -This may change the effectiveness of burden spells, though it may not. Might it be unwise for me to say I'm not sure that the multiplier only affects the player's character? Well, maybe so, but if it doesn't, I don't think most players would be very affected by that. -Added 4 new settings you can choose from. -Fixed some typos here on the discription page. 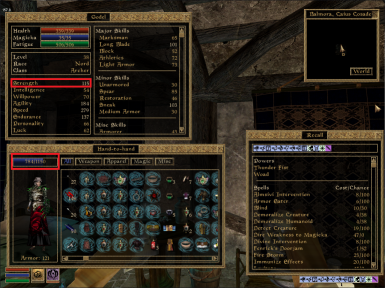 -Enable in Morrowind Launcher or your favoite mod managing program. If you have any trouble with any of the ESPs, let me know and I'll try to resolve it as soon as I see it. -Disable esp with Morrowind Launcher or your favorite mod managing program AND/OR delete the esp you installed from your data files folder. -Prepare to possibly be encumbered. Reccomended, if you must uninstall, to do this next to a container. I made this mod for myself. Then I thought others would enjoy it as well. If you enjoy the mod or have any comments, leave an endorsement or let me know in the discussion section. It means a lot to me.